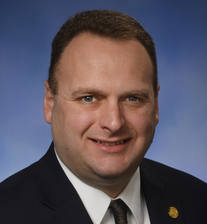 Current representative: The current representative for the 56th District is Rep. Jason Sheppard (R-Temperance). The district covers much of Monroe County, including the townships of Milan, Dundee, Ida and Rainsville and a portion of the city of Monroe, according to House Republicans. He was first elected in 2014. Sheppard is the chair of the House Government Operations Committee and the vice chair of the House Elections and Ethics Committee. A map of the 56th District is available here. Rep. Sheppard raises money through a candidate committee, Jason Sheppard for State Representative, and a leadership PAC, the Sheppard Leadership Fund.